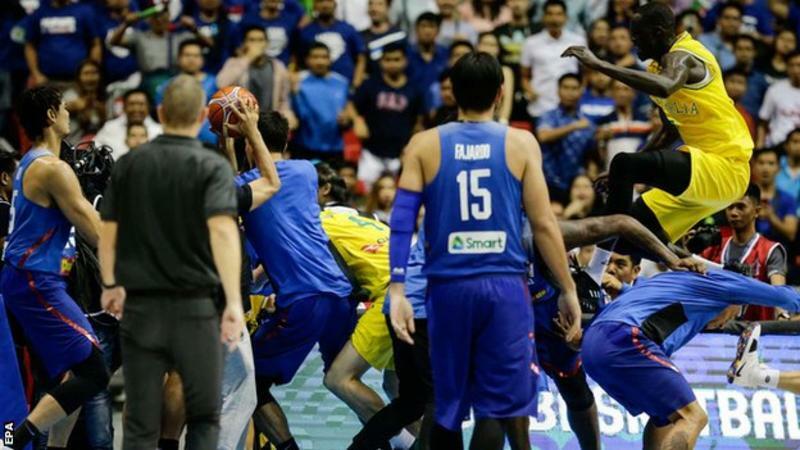 The International Basketball Federation has suspended 13 players following the on-court brawl between the Philippines and Australia earlier this month. Ten Philippine players have been banned for a total of 35 games, while three Australians will miss a sum of nine following the violence that broke out during the World Cup qualifying tie. In addition to the player bans, the Philippines have been ordered to play their next home game behind closed doors. Philippines head coach Vincent Reyes was given a one-game suspension and a $14,000 disciplinary fine and his assistant Joseph Uichico was banned for three games. The national federation was fined $337,000. Fiba has also removed the game’s referees from its Elite Programme, and they will not officiate at any Fiba-sanctioned competitions for 12 months. The fight broke out on 2 July, in the third quarter of Australia’s 89-53 win at the 55,000-capacity Philippine Arena in Manila. Thirteen players were ejected from the game, and it had to be abandoned after the Philippines were left with just one player on court. Ned Coten, Basketball Australia’s president, and his Filipino counterpart Alfredo S Panlilio said they deeply regretted the shameful behaviour. They said basketball had a unique “power to unite”, and the two nations would aim to display the “true spirit of friendship and sportsmanship” in future. “The actions displayed have no place on any basketball court,” their joint statement read. “We wish to apologise to the entire basketball community worldwide – and in particular to our fantastic fans in the Philippines and Australia – for the behaviour displayed by both teams and for bringing the game of basketball into disrepute.